Though most iPhone owners know what which model they have, not everyone does, and sometimes you’ll come across an iPhone and have no idea what it is. This is usually because some iPhone models share the same enclosure, and because of that it can be very hard to differentiate them just by a first glance. 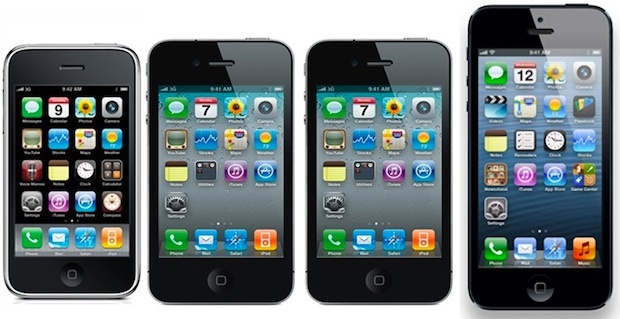 For example, the iPhone 4 and iPhone 4S look almost identical, the iPhone 3G and 3GS also look practically identical, and the iPhone 5 and it’s successor (5S?) are also likely to look basically the same. Thus, the easiest way to differentiate an iPhone when it’s not immediately obvious is by looking at the actual iPhone model number, then comparing that to a list of devices to determine what the iPhone actually is. The other advantage to determining iPhone by model number is that you will be able to know what the device is even if the phone is turned off, meaning if the device is broken, won’t turn on, is bricked by some software issue, or has a dead battery, you’ll still be able to know what you’re working with. That is invaluable when performing iPhone repairs, both for knowing the proper parts to use, and also for restoring or updating through IPSW so that you can use the proper firmware for the device. With that information you’ll want to match the model number up to the actual phone model, which is important for instances where it’s not immediately obvious by visible inspection. You must click on the serial number to rotate to the device product version identifier, you will also see IMEI number and some other details in this screen. Just keep clicking until you see the product type ID in the (#,#) format. The product type ID number is basically a versioning system, like “the 8th iPhone released, second model” for iPhone 8,2. The model numbers are also often the easiest way to differentiate CDMA vs GSM models if the device isn’t active on a cellular carrier to identify it that way, and that is especially true since many CDMA models also include a GSM compatible SIM card slot. 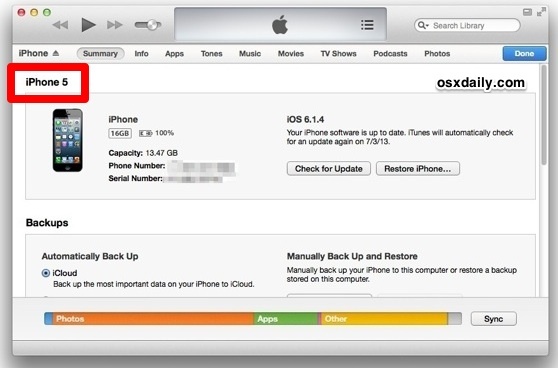 If the model number is missing from the case for one reason or another, you can also retrieve model information from iTunes. Keep in mind that iTunes won’t provide the technical model number, but it will provide you with the actual iPhone model name (i.e. : iPhone 6, iPhone 4, iPhone 3GS, etc) instead. If you were hoping to find that info on the iPhone itself through iOS, it turns out that it’s just not there, despite detailed technical information like the modem firmware and baseband versions, order numbers, serial number, IMEI, and ICCID numbers. Curious, but that’s the way it is for now. 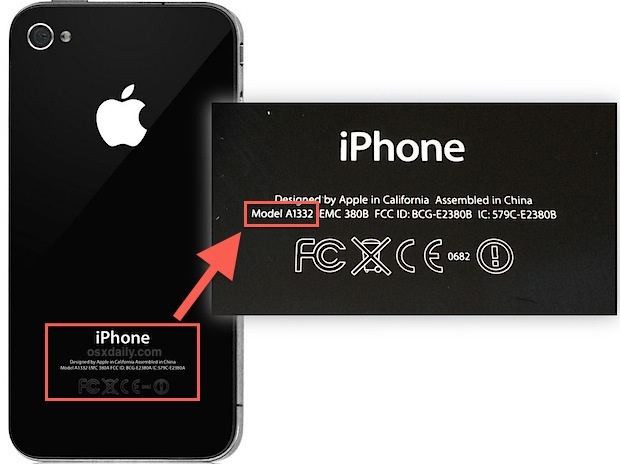 It would be very interesting if you could make an article about how to identify the iPhone by the Model number ( as in carrier / Country it was made for) eg. My 5S is ME298 LL/A where I think ME298 means AT&T, and LL/A Part Of the U.S of A. Who can read that tony print on the phone. A magnifying glass doesn’t help! no model number on the phone, itunes doesn’t say what model either. Any other ways? I got an iPhone 5S from a seller at ebay. it is a model A 1533 – which by these charts say is both CDMA and GSM. The seller claimed it was used on the Verizon network but they tried for 3 hours to make it work. So after all of this I still haven’t a clue. Mike, you can open the settings app, then tap on “general” then tap on “about”, then scroll down to “model”. Keep in mind that on the box this “model” number is under P.N. (Part number), while internally (electronically) on the phone it’s called “model.” Bill, you probably (and hopefully) have a Verizon phone which has both CDMA and GSM bands which make it work for both Verizon (a CDMA carrier) and any GSM carrier in the world (AT&T, T-Mobile and their respective MVNOs are among them). If that’s the case your phones model number is A1533 and P.N. is either ME***LL/A or NE***LL/A. The asterisks are three numbers but depends on the color and capacity (gigabytes) that your phone has. Under my settings on about it says I have a iPhone 6 model number MG492LL/A. The part number is scuffed off the back. Do you know how to get what model I have for parts? This is NOT what I wanted, Why can’t you go into the phones setting and look it up, like looking up the info on your computer in control panel! Please I have an iPhone with Model number A1453, can you guys tell me which iPhone I’m using ?